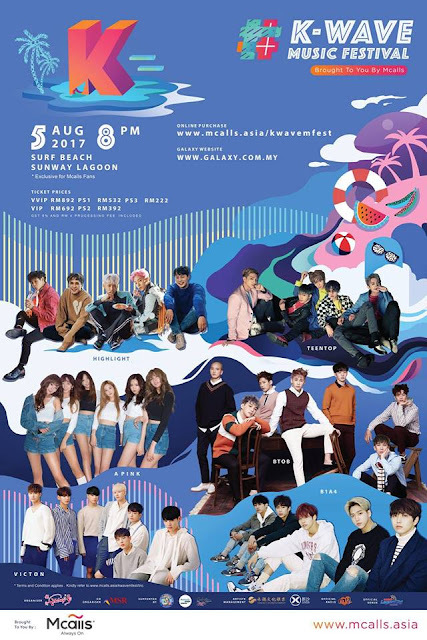 This August, Mcalls is bringing you the all time favourite K-pop idols, Highlight, B1A4, BTOB, Apink, Teentop and Victon to K-Wave Music Festival 2017. On 5 August, the idol groups will be coming to Malaysia and perform at Surf Beach Sunway Lagoon at 8pm! 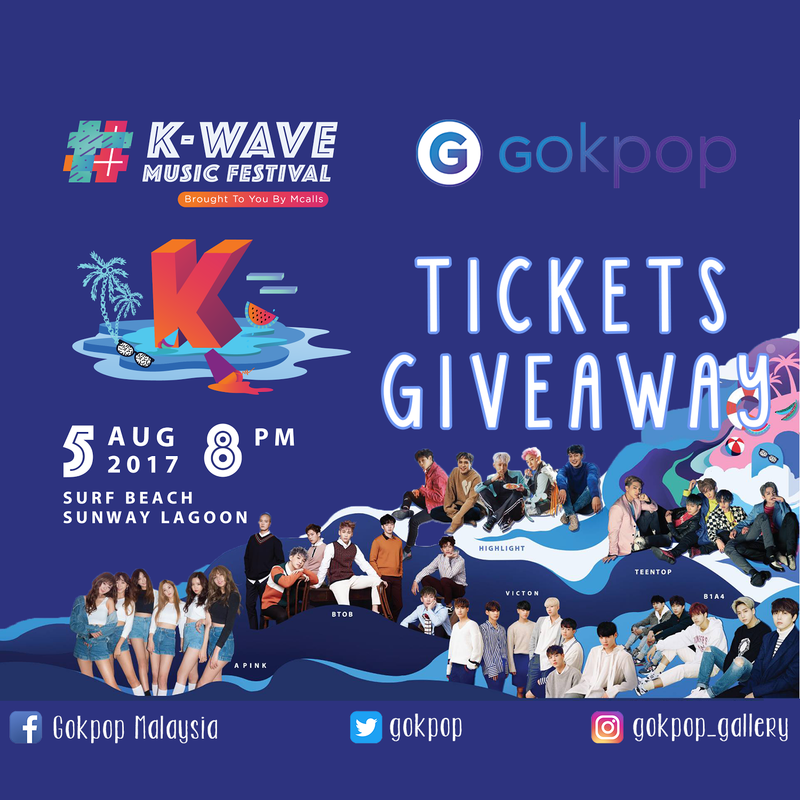 In collaboration with Galaxy Group, GOkpop Malaysia is giving away a total of 6 pairs of PS3 Rock Zone A tickets to our readers. The giveaway is conducted on our Facebook, Twitter and Instagram. Check out each mechanism and try your luck to grab the tickets! We are giving away 3 pairs tickets on Facebook, 2 pairs tickets on Twitter and 1 pair tickets on Instagram. 3 Winners from Facebook will be selected. 1. Follow @gokpop on twitter. 2. 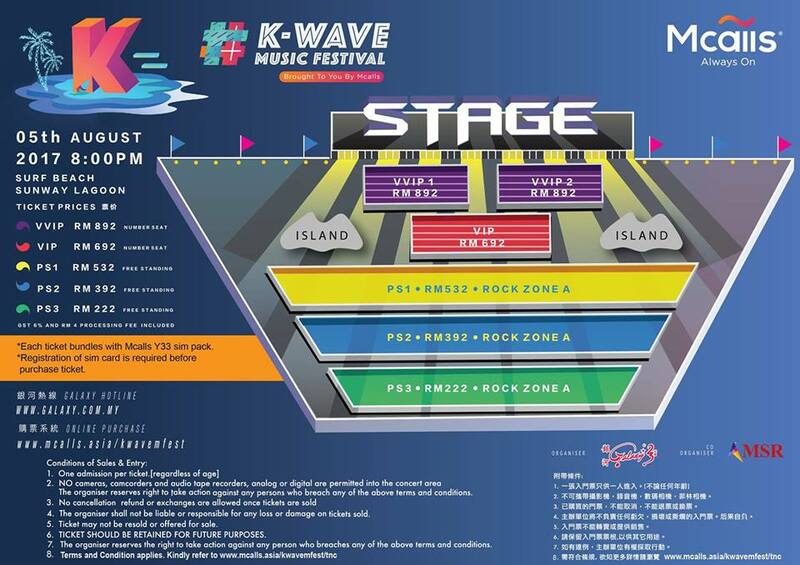 QUOTE RETWEET the giveaway tweet with the caption "I want to go #KWAVEMUSICFESTIVAL!!" Kindly note that all winners will be selected randomly. *Make sure to set your post/account to public if not your entry is not able to track. 2. Winners will be contacted before 3rd of August (Thursday) 11.59pm. 3. Winners have to PM Gokpop with their full name, IC number and contact number before 4th of August (Friday) 11.59pm. Failing which prize will be forfeited. 4. In the event of unforeseen circumstances, Gokpop reserves the right to alter, amend or cancel the contest without prior notice. Mcalls K-Wave MUSIC FESTIVAL, Brought To You By Mcalls happening at the Surf Beach Sunway Lagoon this 5th August 2017. This event is supported by Malaysia Major Events (MME), a division of Malaysia Convention and Exhibition Bureau (MyCEB), an agency under the Ministry of Tourism and Culture. All the artists will now have a closer interaction with their Malaysian fans on that night. Let’s make this a lifetime memorable event for yourself and a night for all your idols! Grab your tickets now as it’s high on demand and selling fast. For more info, visit Mcalls Digital Lifestyle Store at LG 2.141, Sunway Pyramid Mall (Orange Atrium) or Buy Tickets counter at Concourse Level Sungei Wang Plaza.